You rarely see a border collie looking sad or listless. They are either asleep, alert, or active. They are also rarely overweight, largely because most are working dogs that spend their lives racing up and down mountainsides. They have an enthusiasm for life that is shared by all dogs but that reaches its zenith in this particular breed. My parents owned a border collie called Gyp. 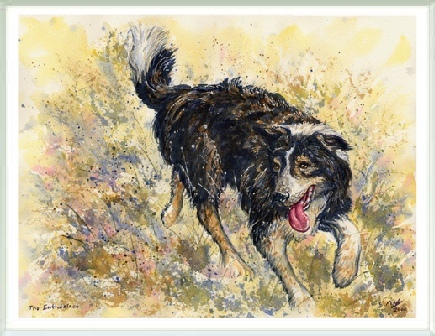 For them he was a pet, but for his previous owner (sadly deceased) he was a good sheepdog. Gyp’s reputation as a hard worker was sufficient that he was frequently brought out of retirement to help other shepherds when an extra dog was needed to bring the sheep down off the hill. Gyp was also intelligent enough to know when he’d had enough. One day he was borrowed and sent up the hill with other dogs for a group of sheep at the top of a very steep slope. Gyp was no longer young, and had developed a quiet dignity enhanced by the fact that he never barked or made a fuss. Partway up the slope, Gyp realised that he could see his home in the distance. He paused, looked at the shepherds below and the sheep above, and left them to it. When he got home he flopped in his usual place in front of the fire, then moved to the back of the room, then stood up and pushed the door open and lay down again in the draught - totally oblivious to the looks of incredulity on the faces of the suddenly chilled human occupants. Gyp was not only an enthusiast for life, he was also an enthusiast for his home comforts.